It has always been the foliage that has given Bergenia it reputation as a great garden plant. Heart shaped, large, textured and also 'squeaky'. As with many plants, over the years Bergenia have been hybridised, we now have selected form for sale that offer wonderful flowers in a range of colours. And the development in foliage colour has also been an improvement in recent years with Bergenia 'Eric Smith' being a classic example. So anything but dull, Bergenia or 'elephants ears' are today a popular clump forming evergreen with large glossy, green leaves that add texture and colour to a shaded area of the garden. The large leathery leaves of Bergenia are where it gets the name 'elephants ears'. Bergenia cordifolia ' rubra' is a pink flowering variety producing upright flower stalks in winter and early spring. 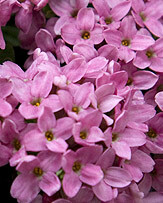 These flower stalks will grow to 30cm and planted in groups or individually they make a fine display. Bergenia will grow in shade, however given a little more light the flowers will be more consistent. A humus rich well drained soil is best. Moisture in warmer months is essential for good performance. Apply a general all purpose fertilizer in early winter. We like to plant Bergenia in spring, it seems to give them time to settle in and develop a good root system before winter. A humus rich moist soil with good drainage. More sun in cooler areas, however you may need to mulch then to prevent frost burn. 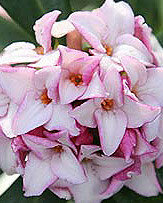 Try to plant in a sheltered position, Bergenias do not like cold winds. You can remove damaged foliage in spring, however look to provide protection instead. You will need to divide clumps every 4 - 5 years as they tend to die back in the centre. 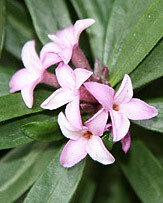 It is best to dig the whole clump in spring and replant the strongest plants. Propagation is by division, although you can try seeds if you are extra keen. Plant the seed in spring into a tray in a cold frame and keep warm until the seeds germinate, usually 2 -4 weeks. The varieties that we find for sale do co me from different areas and vary in appearance. B.crassifolia is from Siberia and it handles cold weather as well as any plant. B.cordifolia come from a little further south, Mongolia and Northern China. 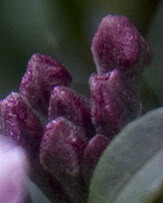 This is the species that have foliage that turns to a reddish green during winter. These two are not as neat a grower as some others.
. ciliata is the variety of choice for many, large green textured leaves. B. purpurascens has rather narrow leaves and could escape the 'elephants ears' name. The foliage is green in summer and then turns a good crimson red in winter. It does need the cold to change colour. Bergenia 'Abendglut' has magenta flowers, very striking. Bergenia 'Bach' has large white flowers that become flushed with pink as they age. Bergenia 'Overture' with its vibrant magenta flowers and foliage that tends to a deep red in winter. Bergenia 'Bressingham White' is famous white flowering form. Bergenia 'Eric Smith' is worth growing for the wonderful winter foliage, deep red in mid winter. Look for Bergenia ciliata a deciduous type with quite large hairy leaves. Mail order specialists of herbaceous perennials, including bearded irises, herbaceous & tree peonies. 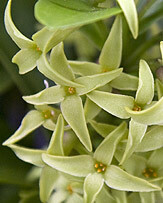 The catalogue and website list over 700 different varieties.